After a great debut with Haunted (you can read my review here - http://www.flipkart.com/reviews/RV0VT...), Douglas Misquita set the bar high, and his sophomore effort 'Secret of the Scribe' does not disappoint. When the book was announced, I was a bit disappointed as I was hoping for another book in the Ingram series (*hint*). The plot differs a lot from his first book, but it once again a fast paced page turner. The book is action-packed right from the get go. The book transports you to various locales, each vividly described. The basis of the book is the hunt for the mythical Book of Thoth - the Book of Wisdom of the Gods; a Book that contains the secrets of the language of all earthly species and languages yet unknown (from the blurb). The power-hungry Mark Steinberg (whose character seemed very interesting but is sadly not present after the initial chapters) unleashes his band of goons to recover the book in the hope of perfecting his nanotechnology-based communication/mind-control devices. What follows are hair-raising expeditions and action-packed scenes at various sites across the world (including one in Bandra, Mumbai). Once again, Douglas employs his fast-paced narration style with seemingly unconnected stories within the story all coming together towards the end. One of my major gripes (other than the editing mistakes) is that the book was a bit too short. A few of the characters could have been developed a bit more to stretch out the plot. All in all, like Haunted, this book is difficult to put down, so I would recommend reading it over the weekend. It has a gripping storyline combined with a fast pace I look forward to reading more of Douglas' works in the future. My rating - 4 out of 5. A good read for those who enjoy mystery and adventure. 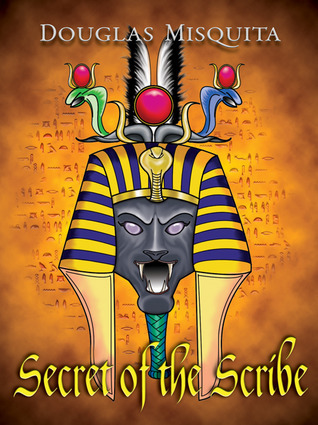 Sign into Goodreads to see if any of your friends have read Secret of the Scribe.